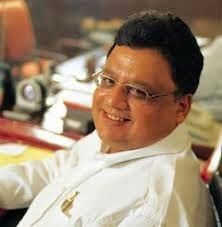 Rakesh Jhunjunwala has made some changes in his Rs.5500 crore portfolio.He reduced the exposure in Titan industries,Lupin and Crisil.He raised the stake in Kesoram ,Dewan Housing finance,VIP industries,Escorts and First source solutions. He maintained the investments in Geojith BNP paribas,Anant raj,sterling hotels and prime focus unchanged.He expect good returns from indian equities over next 3 to 5 year period. Kochouseph chittilappilly is a role model for many budding entrepreneurs in kerala.He was born in a village named parappur, near Trichur and completed child hood education in a parish school.After graduation from Christ college,Irinjalakuda and masters in physics from St.Thomas college,Trichur, he joined as a supervisor trainee in an electronic manufacturing company. He worked there for three years for a monthly salary of Rupees Eight hundred and fifty. An ambitious entrepreneur cannot stay long in a small platform which restrict knowledge and growth opportunies. In 1977, he decided to start own business by seeing the degrowth in the company where he worked.That amazing decision to face the risks and challenges of business,which was not experienced by him earlier,created history in electronics. Kochouseph started with a borrowed capital of rupees one lakh from his father,which helped him to set up a modest stabilizer manufacturing unit in a 400 sq.ft rented shed in ernakulam.He travelled around ernakulam in his scooter and sold voltage stabilizers. The brand ‘V Guard’, named by him, indicate voltage protection.After one year of operations,he managed to increase the staff strength from two to twenty people. V-Guard stabilizers gained market leadership in a short span of period,competing with many low quality stabilizers from North india,mainly due to the after sales service. 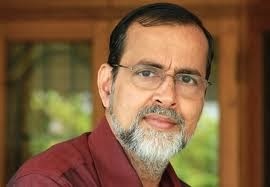 By 1980,he spread his business to all the districts in kerala and appointed marketing team and dealers to achieve more business growth.Then,he had to face big trade union issues which was a common threat for kerala's industrial development .These challenges led to change the business model of local manufacturing towards outsoucing production.He encouraged self help groups of women from small units to undertake manufacturing of vguard and this helped him to grow further without trade union issues. However,Kochouseph's aim was beyond the local market of kerala.He expanded business to Tamilnadu and Karnataka in 1986. Next success happened from Manufacturing of water pumps which created huge customer base for his company.Kochouseph's vision of expanding the brand as a diversified electrical appliances company became a reality with wide product range of wiring cables, motors,water heaters,UPS and ceiling fans.In 1999,he opened veegaland,an amusement water theme park in cochin and it became a success by expanding the amusement water theme park to Bangalore and Hyderabad.Now,it is rebranded as Wonder la and expanding to other places like chennai. Kochouseph's wife sheela started V star creations in clothing industry and his son Arun is taking care of veegaland developers in real estate field.Success of an entrepreneur won't be complete without transforming a start up business towards a well diversified and growing company.With wide marketing network all over India,Kochouseph chittilappilly have built not just a big company but jobs for thousands of people too. Warren Buffet is the largest investor in the world.He is the chairman of Berkshire Hathaway.Buffet is Known as Oracle of Omaha.He started investing at the age of 11.Buffet's father Howard was a stock broker and later became a U.S Congressman.Buffet studied at Wharton school and graduated from Columbia business school. After post graduation,he worked as a socks analyst with Benjamin Graham,the author of 'Intelligent investor'.In 1956,he started Buffet Associates ltd.In six years, the firm had networth of $ 7 million.By next year,he had three partnership firms.In 1962,he merged all firms to invest in Berkshire Hathaway, a textiles manufacturing firm.Buffet. In 1970,he became the charman of Berckshire Hathaway and his net worth reached $620 million in next 9 years.in 1985,he stopped textile divisionand concentrated on insurance business.His Company purchased leading firms such as See's Candies, Fruit of the Loom, Dairy Queen, The Pampered Chef and GEICO Auto Insurance. 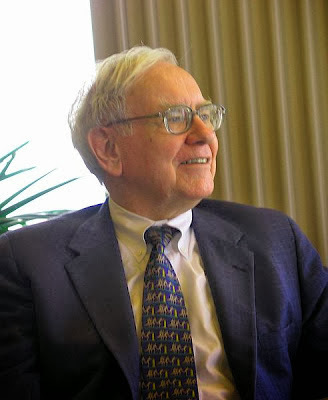 Buffet examined the intrinsic value of companies before investing.His major investments include Coca Cola, American Express and the Gillette Company.He avoided technology stocks and it saved him from 'dotcom bubble' later.Buffet claimed that his success is due to the friendship with Charlie Munger, who later became vice chairman of Berckshire hathaway. In 2006,he donated majority of his wealth to the Bill & Melinda Gates Foundation.He is considered as a true legend with a consistent place in Forbes' richest people list. Robert Kiyosaki is a Japanese American entrepreneur and author of international best seller ‘Rich Dad Poor Dad’ .He was born in Hawaii. After high school, he graduated from U.S Merchant Marine Academy.Then; he joined the U.S. Marines as a deck officer in 1969 and went to Vietnam as a helicopter gunship pilot. He returned from Vietnam in 1975 and became a salesman at Xerox Corporation. After three years,he started his own company.Unfortunately it went bank rupt. After struggling with Tshirt business,he incorporated Cashflow Technologies, Inc in 1985 and it became a success.Apart from running two successful business firms, Kiyosaki has also invested real estate,mines,stock market and precious metals. “Just know that it’s fear that keeps most people working at a job. The fear of not paying their bills. The fear of being fired. The fear of not having enough money. the fear of starting over.That’s the price of studying to learn a profession or trade, and then working for money. Most people become a slave to money…and then get angry at their boss.” . 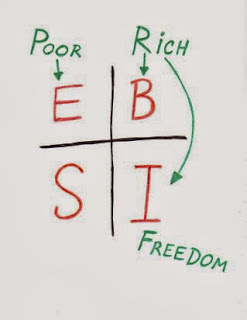 The CASHFLOW Quadrant, is a concept developed by Robert Kiyosaki, the author of 'Rich Dad, Poor Dad'.The letters in Cash flow Quadrant are E,B,S,and I.It shows the potential of wealth creation among people with different work profile. The EBSI letters are as follows. E: Employee – Working for someone else.He earn a fixed salary per month.There are certain limits for the income potential of an employee. S: Self-employed – Self employed person doesn't have a boss.He have freedom.But,income is depended upon working time. B: Business owner – Business owners make money with a sound business set up.He utilise other's time,money and sills to make money. I: Investor – Investor focus on various passive income opportunities.Money work for them,without active involvement.They invest in real estate,equities,precious metals,art etc. 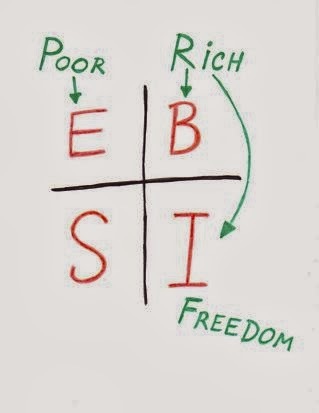 As per Kiyosaki's words, an employee or self employed person may never accumulate wealth. But,Business Owners and investors create wealth and attain financial freedom. 3. Investments in financial markets.eg:stocks, bonds, funds etc. 4. Commodities such as Gold, silver and other metals. A common man should aware of this fact,if he want to create more money and wealth.Anybody can become a business owner or investor over a period of time with small and regular investments.